Egyptians to have a monopoly over its production and distribution. 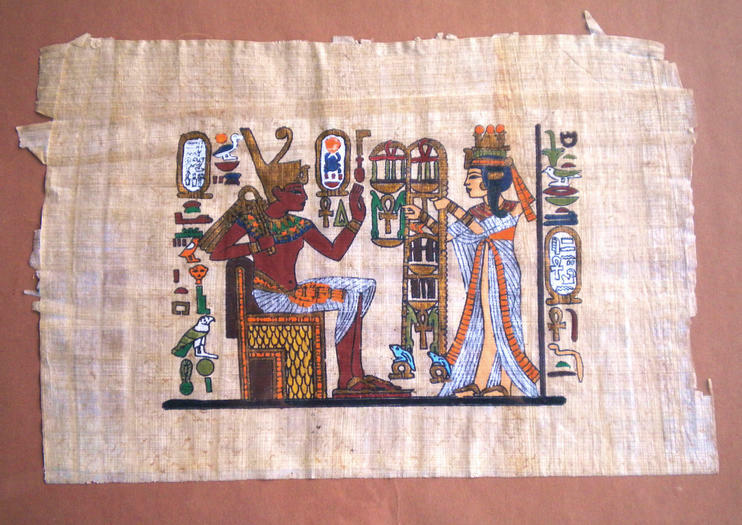 The Papyrus Institute is a government-­approved museum and shop not far from the Pyramids in Giza, where visitors can browse and buy a huge selection of hand­-painted papyrus prints. Prices range from the cheap to the very expensive, but bear in mind that these prints are the authentic article and make for some quality souvenirs. Staff at the Papyrus Institute talk visitors through the entire process of manufacturing papyrus, including a demonstration of exactly how it is made. The Papyrus Institute is located in Giza. If looking to purchase items, be prepared to haggle as the first price stated is usually open to negotiation. Experience Egypt on an 8-day tour encompassing Cairo, the Pyramids of Giza, a cruise down the Nile, and stops in Aswan and Luxor. Navigate immigration and customs with a your guide, who greets you at the airport upon arrival. Then explore the Pyramids, the Egyptian Museum, and Papyrus Institute. Next, fly to Aswan and embark on your two-night Nile cruise where you see Kitcheners Island. Sail to Edfu Temple and then on to Luxor to see the valley of the Kings and to visit Karnak and Luxor temples before returning to Cairo for a final night before getting back to the airport. Cover all the highlights of ancient Egypt—without skimping on comfort—during this hassle-free, full-day tour from Dahab. Most sights are spread out, making them tough to cover on your own. But you’ll travel comfortably between locations in an air-conditioned bus, enjoying perks like onboard bathrooms. Visit the Giza Pyramids, the Sphinx, and the Egyptian Museum, with free time to shop for souvenirs. Upgrade to include a river cruise along the Nile. Fly to Cairo on a private tour from Sharm El Sheikh and explore monuments, museums and markets with an Egyptologist. Learn this region’s fascinating history as you visit the Giza Plateau’s pyramids and sphinx — consider adding a visit to the interior of a pyramid or the Solar Boat Museum — then discover glittering artifacts and ancient mummies inside the Egyptian Museum. Follow your guide through the narrow aisles of Khan el-Khalili bazaar and learn how scrolls are made at the Papyrus Institute before boarding a return flight for Sharm El Sheikh. Discover Cairo on a day trip by air from Sharm El Sheikh, and explore the ancient city with a licensed Egyptologist. Discover gleaming treasures in the Egyptian museum and visit a papyrus institute. Purchase a felucca ride to a traditional restaurant — or simply board your air-conditioned minivan — and enjoy a buffet lunch on the banks of the Nile before leaving the city for the Giza Plateau. Take in the mysterious Sphinx and walk between the pyramids, stop by a Cairo bazaar then board your return flight to Sharm El Sheikh. Explore Cairo’s monuments, museums and markets with an Egyptologist on a private, full-day tour from Sharm El Sheikh. Travel to Cairo in an air-conditioned vehicle, then learn Egypt’s fascinating history as you discover the Giza Plateau. Take in iconic views of the sphinx and pyramids, add an optional tour of the Solar Boat Museum or a pyramid interior, then take in gleaming arifacts and priceless relics at the Egyptian Museum. Visit Khan el Khalili bazaar and visit the Papyrus Institute before beginning your return trip to Sharm El Sheikh. Ride to Cairo from Dahab in a luxuriously equipped bus to see the ancient wonders of the Egyptian capital on this guided, full-day tour. Visit such incredible sites such as the Sphinx, the Great Pyramids, the Egyptian Museum, and the Valley Temple.